IT WAS hailed two decades ago as the most bizarre and incredible tale of abduction by aliens ever told in Scotland. Garry Wood and Colin Wright made headlines across the globe when they revealed their extraordinary story of being taken prisoners by extraterrestrials in a flying saucer as they were driving towards a village in Lanarkshire to deliver a satellite TV system to a friend. After being hypnotically regressed they recalled, in astonishing detail, how they were taken on board the craft, stripped and examined by strange creatures before being returned to their vehicle on the A70 Edinburgh to Lanark road on the outskirts of the capital. Plates made for brunch: The luxe look without the price tag Add some soul to supper and some bite to breakfast by giving your cupboards a welcome update with this fresh crockery from Sainsbury’s Home. Sponsored by Sainsbury’s Home Today, newly declassified secret government “X-files” reveal that a two-page report on what became known as the “A70 incident” was sent to the Ministry of Defence’s UFO desk in 1996 – four years after the mysterious encounter on 17 August, 1992, near the Harperrig reservoir. The document – headlined “Unexplained Aerial Sighting” – is based on evidence provided by Mr Wood, then a 33-year-old ambulance technician from Edinburgh. He and his friend were on their way to the village of Tarbrax in South Lanarkshire when the incident happened. About 10pm at night they spotted a “black” object in the sky above them. It had no lights, was round at the bottom, had three parts to it and was 30ft wide. According to the report, Mr Wood had contacted the police, a doctor, the BBC, a university and even a psychologist “to get some sort of explanation”. Mr Wood said in a newspaper interview in 1996: “I saw three creatures coming towards my car. I felt intense pain, like an electric shock. Then I was in some room. I saw these things like wee men moving about, doing something to me. I could only see up. Then this 6ft creature approached. “It was white-grey in colour with a large head and dark eyes with a long, slender neck, very slim shoulders and waist. There were either ribs or folds of skin on its body. The arms were like ours, but there were four very long fingers. Mr Wood also claimed that a red-hot poker-like object was put into his eye as the aliens carried out their examinations. A London-based film production company, DRB Entertainment, recently announced plans to make a movie of the “A70 incident” and leading Scottish actor Billy Boyd, who starred in the Lord of the Rings trilogy, is expected to feature. 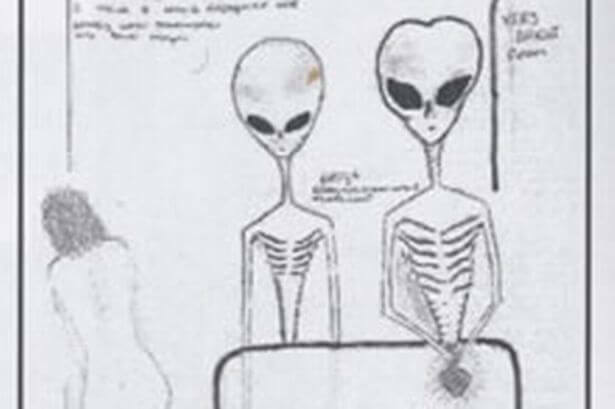 The A70 document is among seven reported UFO sightings in Scotland which have been declassified in the latest release of UFO files from the MoD to the National Archives. The newly released documents also include details of a lengthy briefing on UFO policy which was given to Tony Blair when he was prime minister when the government was about to implement the Freedom of Information Act, and the findings of an “Unexplained Aerial Phenomena” study which suggested that some UFOs were rare atmospheric plasmas that could be harnessed or used by the military as “novel weapon technology”. A 1982 memo also noted a fall in numbers of UFO sightings since the beginning of the Falklands War, but reported “large numbers of UFOs have been seen in the vicinity of the Task Force – presumably Little Green Men in ponchos”. He added: “The question of whether or not we’re alone in the universe is one of the biggest and most profound questions we can ask. People are fascinated with the idea that we might have been visited and these files chart MoD’s attempts to grapple with the subject.